Much as we enjoy – and intend to continue – travelling to meet users and potential users of APL, we are also launching a new initiative that we hope will make it possible to reach more people, with a higher frequency. On May 18, we launched the first Dyalog Webinar, with a presentation on new file portable system functions by Richard Smith, followed by Morten talking about the HTML Renderer – yet again! If you missed the event, the recording can be found at https://dyalog.tv/Webinar/?v=cPwlaEaTm4Y. It is our intention to record future webinars as well – although we are also hoping that the timing (4pm UK time on a Thursday afternoon) will allow people from as far East as Moscow and as far West as the US Pacific coast to follow the events live. We have designed a logo for the webinars; where our user meetings started out with 7 years of Norse Wyrms, followed by 7 years of Norse ships, the webinar logo shows Odin's two ravens Hugin and Munin. Odin sent the ravens out at the start of each day, and in the evening they returned to him with news of the world – fitting mascots for a webinar series! 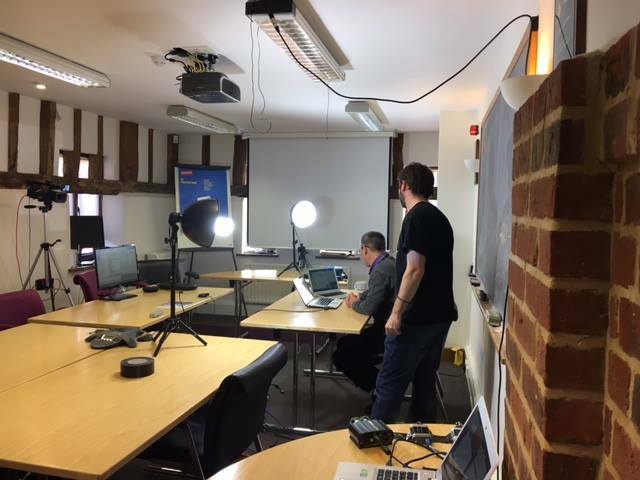 You can follow the live stream from our recording studio in Bramley on https://dyalog.tv/Webinar/, and pose questions to the presenters via chat. Our intention is to host a 8-10 events each year, usually on a Thursday. The next event will be on Thursday June 29, when we will celebrate the release of Dyalog APL version 16.0 (fingers and toes crossed that we will actually be able to roll it out that day)! The topic of the July webinar will be APL Source Code Management (Thursday 27 July). Aaron Hsu and Adám Brudzewsky are leading a push to attract the attention of readers outside the traditional APL community through appearances in online discussion forums. Adám appears frequently in the APL chat room at StackExchange, and is a prolific contributor of APL solutions to the Code Golf section of StackExchange. Aaron has hosted some very interesting presentations (and successful defences) of his approach to writing an APL compiler in APL on YCombinator: A 2-hour video presentation and an ensuing discussion are well worth watching and reading! Follow us on Twitter, Facebook and LinkedIn for reports and notifications on upcoming events. Upcoming events are also advertised on our website. We also encourage you to follow our Blog – where you can find new stuff about our experiments with Raspberry Pi and much more.